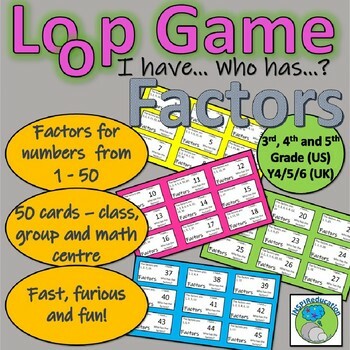 Factors of number 1 - 50 Loop Game (50 cards) I have ... Who has? 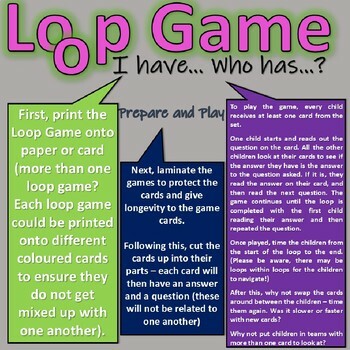 This Loop Game has been devised to support the work we have been doing in the classroom on Factors of numbers from 1 - 50. Not only that, but it also supports work in prime numbers and squared numbers once the children understand that 1 or 2 factors make a number prime, and an odd set of factors makes the number squared! The game is easy to set up - simply download, cut up and play. With 50 cards (and 4 additional cards to copy and add your own numbers) it is ideal to play with the whole class, with every child getting at least one card, with other children getting more to really stretch their maths ability. 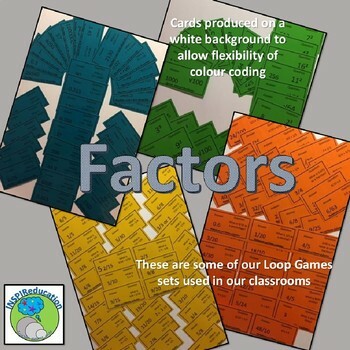 The game is incredibly versatile and can be used for a range of other games too (dominoes, maths centre and so on). 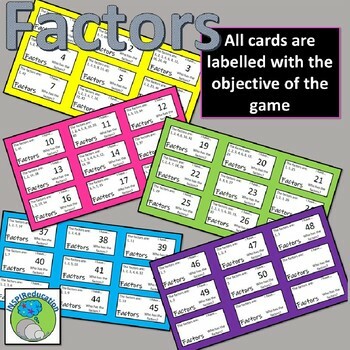 The game starts with a child reading out the number on their card, "I have number … who has the factors?" The other children look at the answer section on their card and see if they have the factors. If they have, they read out the factors, and then give the rest of the group the new number. The game continues until all the cards have been read out. The game is fast, furious and fun, and if children have more cards than just one, it really keeps them focused and waiting for their turn. Full instructions are included within the resource. Handy hint: To keep the cards fresher for longer, laminate the cards before cutting. We hope that you find our resources as fun as our children do!